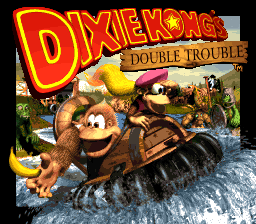 Donkey Kong Country 3: Dixie Kong's Double Trouble is the third and last game in the SNES Donkey Kong Country series, and the most ambitious with its more open overworld. Kracka, the red version of Knocka in a TNT barrel exclusive to the GBA version, was actually created for the original game. All of his sprites are present, along with an alternate red palette for the normal TNT barrel sprites which would have been used if he was picked up and thrown. There is also a purple palette for the normal barrel sprites, which suggests that Kuchuka could be picked up and thrown at one point. In the final version, Kuchuka cannot be carried or defeated by any means. Sprites of what appears to be a Lurchin revolving around something. In Barbos's Barrier, Barbos spawns two purple Lurchins at a time to protect her left and right sides. When the player defeats one, the other one moves over to protect the weak spot nearest to the player, which is where this animation would fit if it was used. In the final version, the Lurchin continues to use its defensive position as it moves in front of or behind Barbos. Unused sprites of Kopter taking off, standing idle, and being defeated. 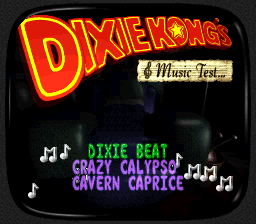 The defeated sprite was later used in Donkey Kong Land III. 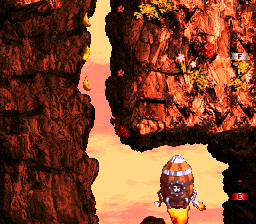 In Donkey Kong Country 3, Kopters are always flying and there is no way to defeat them. A sprite which is meant to overlap the entrance to Arich's Ambush in the Kremwood Forest map. In the final version, the entrance is always dark. Squawks's "hurt" sprite from Donkey Kong Country 2 is present here as well, although the sprite that replaced it isn't actually new: in any DKC2 level with Squawks or Quawks, grabbing on, or being hurt by enemies causes the bird to briefly display this animation frame. The sprite was restored in the Game Boy Advance version. An unused version of Baron K. Roolenstein being electrocuted exists in his set of compressed sprites (the final sprite is in the standard uncompressed set of sprites). This early sprite has straighter, stick-like fingers. 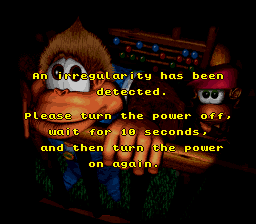 Present at 0x3779E9 in the ROM in all versions is most of Klubba's dialogue left over from Donkey Kong Country 2: Diddy's Kong Quest. scurvy dogs ye are, A-harrr! ye don't cross over, mateys! an' I'll throw ye overboard! Jones's locker f' ye! A-harrh! In Swanky's Sideshow, the barrel that Swanky Kong stands in has bananas inside of it. 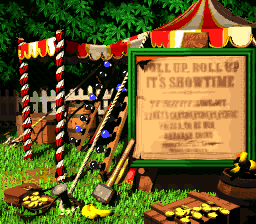 This detail can't be seen in game since his sprite covers the bananas. 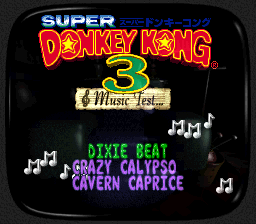 Press L, R, R, L, R, R, L, R, L, R on the file select menu, then enter MUSIC as a code. You can then select music and listen to it accordingly. 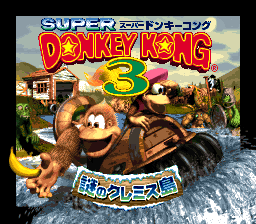 If you throw Kiddy against a steel barrel or a Koin, then jump into a body of water and switch Kongs underwater, Kiddy will warp to the top of the screen. The level Criss Kross Cliffs has much less red Buzzes than in other versions. There is also no Bazuka enemy at the beginning. Pot Hole Panic has considerable lag issues near the end which were fixed in the European/Japanese versions by some layout rearranging. 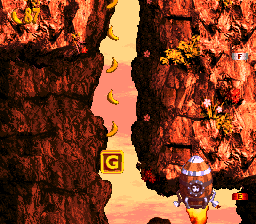 The letter G of KONG and the last Bounty Bird were moved back, the banana bunch was removed and the Kuchuka near the end was replaced by a Buzz. In the Japanese version only, you can skip the boss fight against Bleak by dying and pausing just before the screen fades out to exit the level, which will cause the game to consider the boss beaten. Strangely, the US version of Rocket Rush does not have the G of "KONG" present. This was fixed in all other versions, including the GBA rerelease. Are there any effects later in the game, like EarthBound? Many of the same anti-piracy routines seen in the previous game (and also in Killer Instinct) are present. 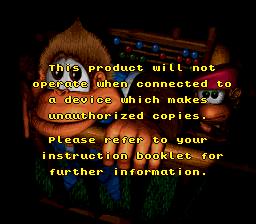 However, there's no evidence currently that the Checksum Verification and Reset Vector Verification routines exist in Donkey Kong Country 3. Failing any of the below tests will display the above unauthorized device message on boot up. Behind the scenes, the hex string 0x2863292031393936 (translates to ASCII (c) 1996) is copied to both $06A3 and the beginning of SRAM (battery-backed memory used to hold the save game data). Ten seconds powered off is necessary for the contents of RAM to decay. If these tests fail again on the second boot (using the string saved in SRAM to determine if it's the second try), then the anti-piracy message is shown. However, if the tests pass, the hex string 0xF49272EE77A6E78A (unknown meaning, but $72 and $77 are the ASCII characters for r and w, possibly for Rareware) is copied to $06A3 instead; if this string is detected at startup, the anti-piracy checks are skipped and the game boots normally. Almost immediately after booting, the Emulation Flag and Direct Page register are examined. The console already being in Native Mode and/or the Direct Page register containing a non-zero value fails the test as these are evidence that another program (e.g., a backup unit menu) was running before the game had a chance to boot. If the Reset Vector was at the top of the stack, the test fails. Explained in more detail in the next section. The beginning of RAM (range $7E0000-7E1FFF) is searched for three types of fingerprints left behind by the unauthorized devices. The two jump tests, along with the stack test mentioned in the previous section, are looking for the various methods that attached hardware can use to switch from its programming to that of the game cartridge. Checks for operation $4Cxxxx, where xxxx is the Reset Vector. Checks for operation $6CFCFF, an indirect jump. Checks for the incrementing 32 byte string $60-7F (i.e., 60,61,62 ... 7D,7E,7F). This includes lowercase ASCII characters a-z. If the game detects 0KB of SRAM, this test is failed. Normally, the cartridge has 2KB of SRAM, but this anti-piracy routine will not be executed if this amount is increased (the typical anti-piracy routine in SNES games). This page was last modified on 29 September 2018, at 11:17.